1992: A group of first year Mackie Academy pupils who raised �130.92 for Cystic Fibrosis Research by taking part in a sponsored swim. 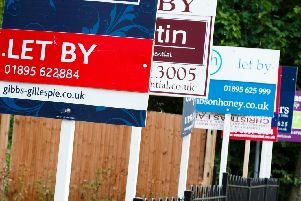 Local people are facing major problems in finding affordable housing in their home area - and even more frustration when the District Council refuses planning permission for parents to build property for their children nearby. This contentious issue is becoming regular fuel for argument at Kincardine/Deeside District’s planning committee, whose meeting last week heard Cllr Jenny Watson highlight the problem of one father at Strachan, who had been refused permission to build three houses for his daughters. Incomers, it has been argued, are being attracted by lucrative jobs provided by the oil industry in Aberdeen, keeping property prices high throughout the North East, and often at the expense of the indigenous population. But Cllr Gordon Walkden believed the District Council could not go buying land “willy-nilly” in the countryside with the intention of building council houses, simply to help people who wanted their relatives to live near them. “The Council has adequate policies designed to help people who can’t afford housing,” he added. Doubts about the new Mackie Academy being ready by 1970 were again expressed by Mr John Hutcheson, rector, at the annual prize-giving ceremony in Stonehaven Town Hall last Thursday evening. Mr Hutcheson added: “I wish it good speed and a fair breeze, which it is certainly likely to get at Ury, but I still have doubts about 1970. These I expressed here last year. I asked where were the teachers, the syllabuses, the buildings? We are seeing part of the answer to the last, but the advance on other fronts is, if anything, back. “There has been no great progress in the syllabus situation so far discernible. As for the teacher supply, we do not like the new mathematics one little bit, when it guesses we shall be about 6,000 teachers short in 1970 when the balloon goes up - or bursts. “Worboys” signs are springing up all over Kincardineshire. They are the signs which warn motorists to “Stop” instead of “Halt”, and to “Give Way” instead of go “Slow” because of a major road ahead. These signs, about which many had forebodings, are easily understood and should be welcomed by motorists and pedestrians alike. Included among them, however, are several “Stop” signs where none existed before. On Friday last the wounded soldiers at St Leonard’s Hospital were entertained to a pleasure sail through the kindness of the owners and the crew of the motorboat “Greyhound”. The weather was ideal, with a fair breeze blowing. The “Greyhound” proceeded north for a considerable distance, but owing to the choppy nature of the sea it was found impossible to make a landing at any point on the shore as had been intended. After a very enjoyable trip the motor boat returned to the harbour. The trip was greatly enjoyed by the soldiers. With the first of July, there has been an influx of visitors into the town. Large numbers arrived on Saturday, and what with local people going away for a holiday weekend and visitors arriving with piles of luggage, the railways officials had a busy time. Fortunately the weather is very fine, and our visitors are able to see Stonehaven at its best. Of a forenoon the beach is quite pleasantly full, and the bathing boxes are being largely patronised. We are pleased to intimate that two further handsome donations have been given towards the Memorial to Fallen Soldiers’ Fund, viz., Provost Greig, £10; Mr James Barrie, sen., £10.